My reasons for being eco-friendly mainly centre around wanting a healthy and happy future for myself and generations to come and my way of approaching it so far has mainly involved thinking about reducing the rubbish my household produces, trying to source sustainable products and trying to make the most of everything I have. I’ve never really felt that connected to local wildlife though or quite got what direct impact I can have on it, but things are starting to slowly change. 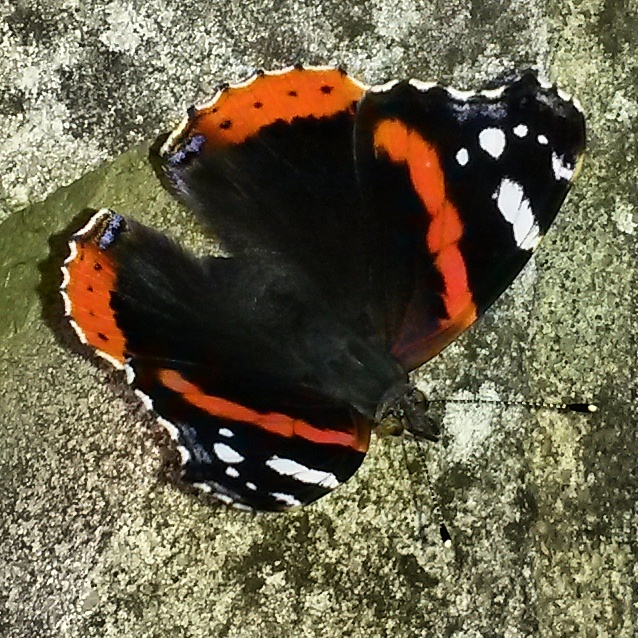 We have a lovely butterfly poster in our kitchen which identifies local butterflies and I was really excited that over the last couple of weeks there have been some red admirals (which I identified via the poster) fluttering around our garden one of which is pictured above. Every so often I do a bit of bug hunting with the kids and we find ladybirds, woodlice, ants, beetles and other bugs. I also grow lots of bee friendly plants like lavender and I have taken the kids to a local museum called the Booth museum quite a few times. It is full of stuffed birds and a few other animals and some animal skeletons. It was only after a few visits that the birds finally got to me. I started to realise some of them were supposed to be local and I had never seen them before and a friend of mine told me they went on a bird song walk with someone identifying all the different bird songs, which I would really love to do when I get a chance. Apparently there are loads of bats in my local area too, which I have never seen. If you don’t know it exists then you can’t do anything to help it! If you have a garden there are lots of small changes you can make to help the wildlife including planting flowers that attract bees and butterflies, to making holes in the perimeters of your garden so hedgehogs can access them to installing bird baths or bat boxes and more! You can help contribute to local studies and national data. There are lots of wildlife websites where you can sign up and share your sightings and you don’t need a garden for this! This can then help identify trends in increase or decline in species and where efforts might need to be focused to help species in trouble. It can increase your enthusiasm about it! I found that when I started to try to spot hedgehogs I became more interested in them and it was really exciting to finally see that one had visited our garden. When I planted a load of lavender because the bees liked them it made me more excited about seeing bees on them and every so often I count how many bees we have on the lavender plants and feel a bit miffed if there aren’t enough bees on them! Another benefit of wildlife spotting/ learning about local wildlife is that it is a great source of free fun! I didn’t have to pay to go into the Booth museum or to join in with the local studies and I got the butterfly poster for free a few years ago when it was being given out at local libraries. It’s well worth finding out what is going on in your local area and having a look online for things like bird, bug or butterfly identification charts and it is a great activity to get kids involved in (if you have any!). I’ve really enjoyed getting to know more about the wildlife in my garden and finding out about some of the visitors it has in the middle of the night as well as in the beautiful sunshine! I also would really like to learn more! How about you? How do you feel about your local wildlife? This entry was tagged badgers, bees, bugs, butterflies, eco, family budget, foxes, free fun, Frugal, garden, Green, hedgehogs, local, nature, sustainable, thrifty, wildlife. Bookmark the permalink. ← 5 years of Eco Thrifty Living! We only have a small garden but I am amazed at the amount of wildlife we see every day. Recently I was admiring a beautiful butterfly that flew past my kitchen window, and we have a large Californian Lilac tree that attracts bees and small birds. Beautiful! How lovely – I was ogling lilac trees on Pinterest the other day. They look so beautiful!